The day was almost entirely consumed by our journey back to Colombo via Galle. We stopped by Galle to say hi to Jayanananda Warnaweera, who happened to introduce us to Mr. Ajit Jayasekara, CEO of Sri Lanka Cricket (SLC). We exchanged pleasantries and updated him on our trysts in Sri Lanka. 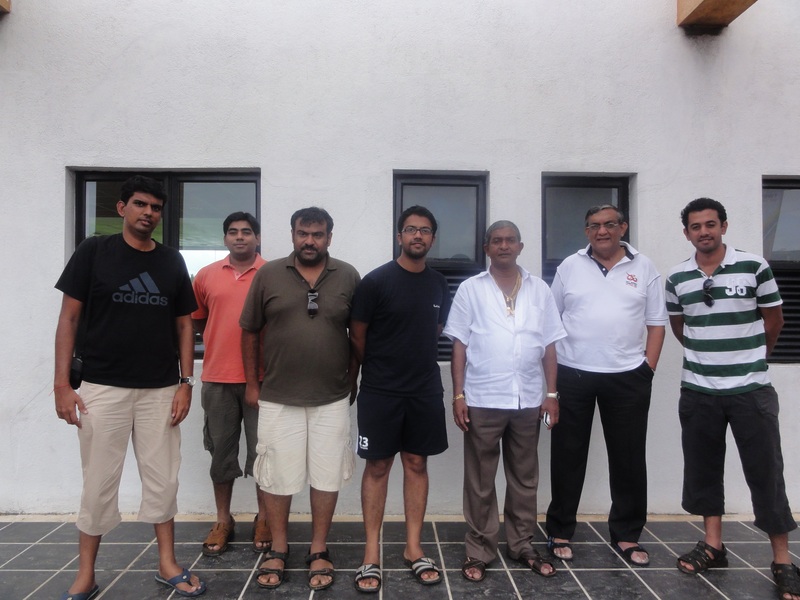 The halt at Galle was brief – we wanted to thank Mr. Warnaweera for the wonderful opportunity he’d provided us to get to know about Sri Lankan Cricket and Galle a few days ago. We promised to visit Galle soon and headed off to Colombo – just in time for a check in to the hotel and a taxi to take us to the India England game at the Premadasa. We spent the best half of the pre-toss period running through a derisive critique of names that had no rights to be here as part of the Indian setup – triggered by observing Piyush Chawla practise his leggies on the field. The popular topic was, in truth, about Gambhir’s struggles (longer formats inclusive) in the middle and how he suddenly – and unconvincingly – lost the ability to play those long innings’ we’d seen him play that landed him the ICC award a couple of years back. His innings of forty odd yesterday was quantifiable, if desultory, but this should be the natural predicate for a man who desperately needs to get his act together at home (extended to subcontinent wickets) prior to tours overseas. The idea of opening with Pathan, at the cost of Sehwag (not in the XI), was a bad one. Pathan has been enduring through some tough times, with his name amongst a few included in the suspect-list. A low score would, in all probability, dip his confidence scales to levels resembling those that unfortunately kept him out of the Indian radar prior to this year. He looked out of sorts – period. With Kohli extending his purple patch to another innings, it must’ve been hard on Gambhir, at the other end, to have curbed his instincts to go after the English attack – which was being made look amateurish by Kohli. To his credit, he stuck to his game plan – although one would imagine he ended up consuming a few balls too many. A strike-rate of 118 doesn’t seem to indicate that. Both Kohli and Gambhir decided to play Swann out (although the former did hole out to Swann at deep mid-wicket)– his 4 overs yielding a miserly 17 runs. I thought Swann was brilliant – I’ve seen him live quite a few times, but as I tried to observe Kieswetter’s work from behind the stumps (and how he reacted to Swann), I couldn’t help but admit that the Englishman is one of the best in the trade. I know Harbhajan ended up with match-winning figures, but out there, if I had to pick between the two of them, Swann looked better. But yes, I do know this is Harbhajan’s first outing in over a year – he will take his share of credit, for sure. I know it might sound convulsive, but the Indian batsmen were sensible in paying Swann his due respect whereas, the Englishmen played shots they’d never want to see videos of against the two spinners. One striking thing about the England innings was how closely it mimicked the debates over their inability to conquer spin in the sub-continent. I almost got a feeling that Piyush Chawla was Anil Kumble in disguise – pardon the pun please. Kieswetter, on the other hand, looked suspect behind the wickets against spin. There have been numerous occasions when deliveries flighted in line with the stumps have tempted batsmen charging forward – only for them to miss and Kieswetter to fumble. His missed stumping of Gambhir highlights the problems that he’s been carrying in his baggage for quite some time. And finally, I know I’ll be spelt a villain if I don’t mention Rohit’s accolades here. To his credit, he played a crucial knock – his innings would’ve been more valuable had the English batsmen applied themselves on this wicket to put up a better fight. After Swann’s arrest, when the Indian run rate looked a touch below par, he did outstandingly well to push the score to 170. His six over covers off Jade Dernbach was my shot of the day – purely for its timing and (lacklustre – but popped-eyes) execution. India will be satisfied, whereas Stuart Broad will have to recognize (in case he hasn’t already) that his young artillery has to handle spin if they want to entertain any hopes of progressing to the later stages of this tournament. We managed to spot a couple of England fans outside the stadium after the game. They were happy to agree for a chat – the video will be uploaded shortly. There are few instances that beat the experience of waking up to the sight and sound of waves splashing against rocks along the coastline. 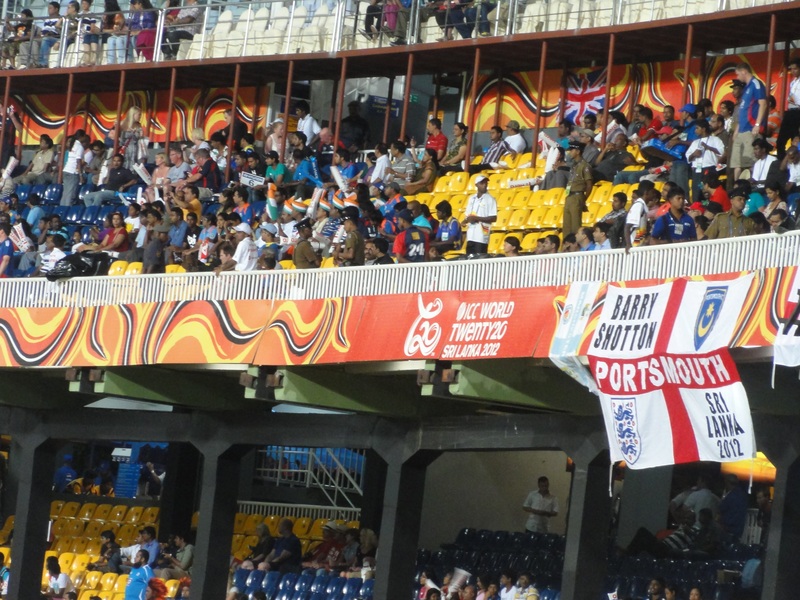 What didn’t help was the showers that followed, adding fuel to our fears of rain playing spoilsport this tournament. Nevertheless, the appeal to walk along the beach while it rained was tempting enough to get us ready within ten minutes, and park aside thoughts of rain persisting. The present was too valuable to let go of. We checked back to the hotel café after witnessing sunshine (much to our relief) to order coffee and tea. Unfortunately, for Goutham and Suneeth, the coffee turned out to be an indigenous version of Ragi-Malt! So much for rounding of a fine morning! 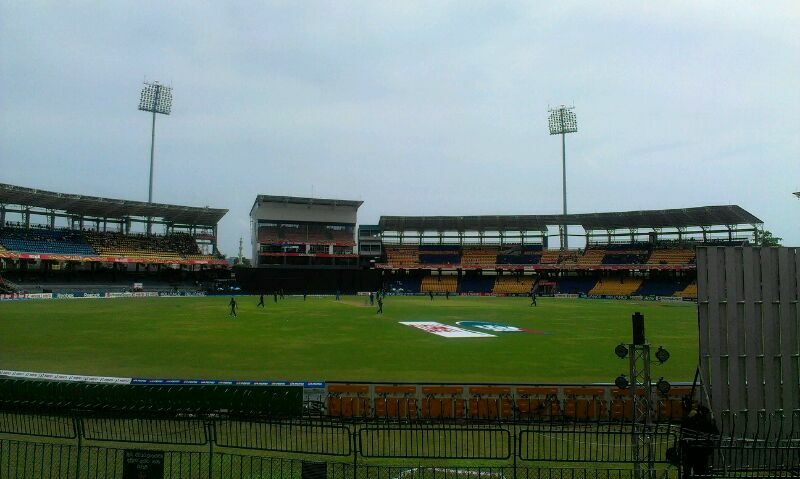 We stopped by Pizza Hut for brunch (thanks to a delay – yes another one – in the taxi arriving at our resort) and realized that we were supposed to head to Premadasa and not P Sara stadium, as we’d most certainly assumed, for the warm-up game between India and Pakistan. The taxi driver, Chamara, told us that he was another Sangakkara fan who rated Nuwan Kulasekara better than Lasith Malinga, calling the latter an actor whose only concerns were centric around colouring his hair. It was an interesting comment given the cricket fan’s perception of Malinga in Sri Lanka – you could’ve got away if you’d thought he enjoyed a Warne-like image among the public. 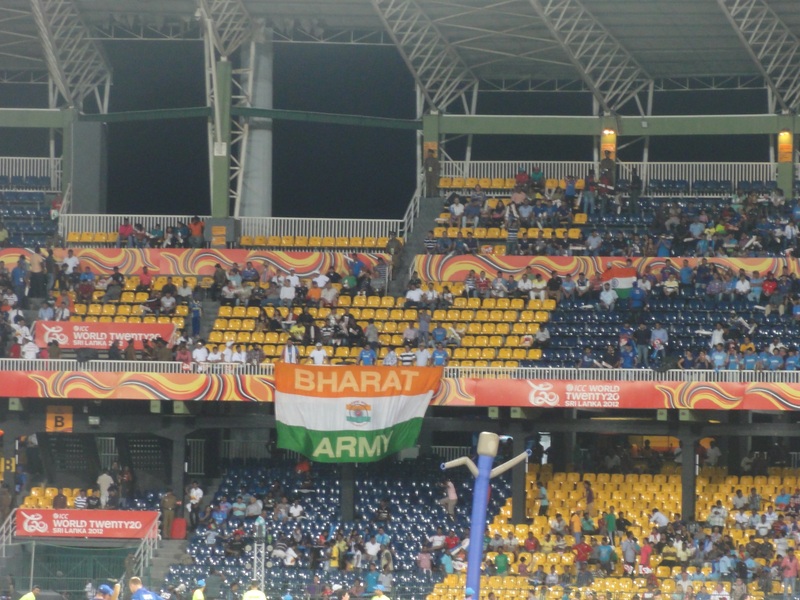 We made it to the Premadasa by the second over of the Indian innings. Gambhir, who we’d assumed wouldn’t play after reading the reports that suggested he was injured, didn’t last for too long – Umar Gul the predator who disturbed his furniture. Sehwag, with his idiosyncratic ‘just-another-game-in-the-park’ approach was victim to a brilliant catch taken by Shahid Afridi off the bowling of Saeed Ajmal. The entry of Rohit Sharma prompted Triyambak to scream “Who gave this fellow his visa to enter Sri Lanka? !”, something that got most of us in to chuckles. The scorecard at the end of the innings would suggest otherwise, but certainly Rohit’s tryst in the international circuit, highlighted through frequently packed zip-code resembling scores with the odd show of class, would’ve irked other cricketers who’ve been shown the door after a single failure. The picturesque R Premadasa stadium. Kohli’s purple patch doesn’t seem to show signs of crashing in to a dead end, and along with Hashim Amla, he’s been having a remarkable set of two years in the International Circuit, notwithstanding the formats. Unfortunately for us, the Indians lost their way during the second half of Pakistan’s innings and made heroes out of Kamran Akmal and Shoaib Malik – batsmen whom international bowlers, in general, would’ve fancied for breakfast, lunch and dinner. Goutham had got in touch with a few Gray Nicolls cricket gear dealers prior to the trip to check if he could procure gear in Sri Lanka. And a box of Kookaburra cricket balls to take back home so that the CECC boys could get accustomed to bowling/facing the Kookaburra in line with their preparations to tour Sri Lanka later this year. We zeroed down on a pretty popular shop (through internet ratings) called The Cricket Shop, located at Urban Colombo. We chanced taking a couple of tuk-tuks – envisaging options of a cheaper ride, as compared to a taxi from the Premadasa. The route to The Cricket Shop seemed a detour, given that the drivers had little idea of the location we were talking about. Suneeth’s concerns over the rate the driver would charge us fell to deaf ears – both parties being unable to understand what the other was saying. The only word the driver seemed to know was “No Problem.” To add to that, the other tuk-tuk had taken a different route, and Suneeth seemed certain that this was a game to rob a few foreigners off their cash. Suneeth was in half a mind to get down and call a cab, but we figured any adventure (or mis-adventure) was an experience worth shouldering. Fortunately, we made it there eventually and ended up paying 600 Sri Lankan Rupees for the ride. In discussion with Rila Mohamed, Director – Administration, The Cricket Shop, Colombo. The Cricket Shop, at St Anthony’s Mawatha (Mawatha means ‘Road’ in Sinhalese) seemed the one-stop-solution for cricketers, ranging from amateur to pros, for procuring gears. 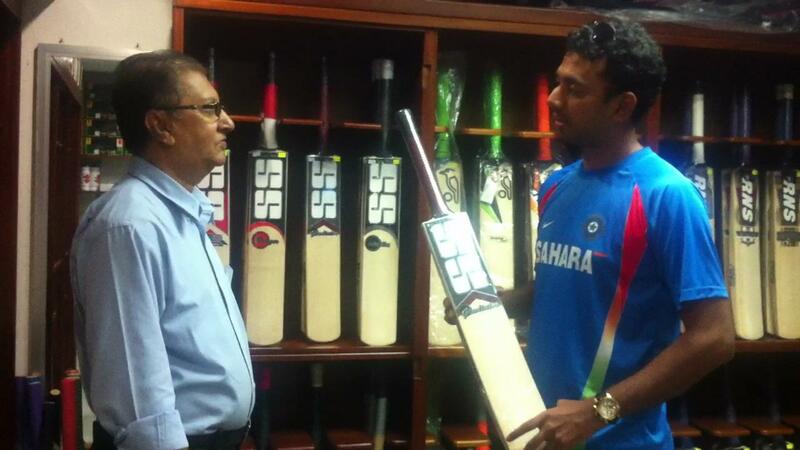 The very purpose of our visit there, as mentioned earlier, was to check out Gray Nicolls gear. The cheapest Gray Nicolls willow was priced at around 45000 Sri Lankan Rupees, with a top end willow costing close to 70000 LKR. The shop had an impressive range of display spanning Kookaburra, Stanford (SF), Puma, CA, Gunn & Moore, and SS – a fast moving brand since Sangakkara and a few other Sri Lankan crickets started endorsing it. The shop Proprietor and Director, Rila Mohamed, was a very friendly man who took time off to explain in detail how he imports bats from India and why SS has become the brand being sought after by youngsters. He boasts of photos and autographs from some of the best players from around the world, while mentioning that since most of the players are sponsored by manufacturers themselves, they stop by in case of an urgent need to procure a quality willow. Trust, he says is the factor that brings most cricketers back to The Cricket Shop. Our hopes of buying a box of Kookaburra cricket balls went for a toss when we discovered that a single piece cost close to 14000 LKR. Maybe it’s time we believe in our players and understand that they, after all, can spontaneously adjust to the demands of the Kookaburra cherry when we get here. This piece of writing (on the squad selection for the upcoming home series against New Zealand and T20 World Cup) may be a little late in its arrival, but its better late than never. A lot has already been said and written about the last assignment of the outgoing selection committee. But I believe everyone has their own way of looking at things and that is the fuel on which the entire business of sports critics runs. Before I begin, let me pay due tribute to the career of arguably the most stylish Indian batsman of his generation, VVS Laxman. Another important pillar – that held together probably the most glorious period of Indian cricket – has finally called it a day. Speculations on his selection in the squad for the NZ series and he placing his individual aspirations before team’s interests have finally been put to rest. That he could have easily chosen to retire after playing the farewell test in his hometown Hyderabad and might have given himself a chance to reach the 9,000 runs milestone, has made him even a greater person in my eyes than ever before. It takes a man of great values to turn his back on such a tailor-made opportunity for a farewell match. VVS has always set examples for the coming generations to follow. Though numbers might not speak all about his talent and contributions, he will certainly be placed among the best to have played the game. His innings in the very famous Eden Test would always come up in discussions about the most stellar performances in the history of the game. The person replacing him in the squad would have big shoes to fill. Coming back to the original agenda of selection of the squad for the NZ series and T20 World Cup, it disappointed more than surprising me. Not that I was expecting radical changes in the squad; BCCI selection committees have never been known for that. But I sure was not expecting to see a couple of names that I can see and was expecting to see some that I cannot. The biggest element of surprise was Piyush Chawla’s inclusion in both the squads. That would have been a surprise even if he would have possessed talent in the bowling department comparable to what Rohit Sharma has in batting, given his performance off lately. His return to the team after such dismal shows in recent future in all forms of cricket did not go down well with anyone (I won’t trouble myself with the statistics; those could be found at various other sources). What was the basis of that move is beyond the grasp of a mere mortal. Piyush Chawla has been included at the cost of a more promising young leg spinner Rahul Sharma. He did not get enough opportunities to prove himself before being dropped. I fail to understand the rationale behind this move. If at all Rahul Sharma paid the price for the alleged doping charges, this is truly a sorry state of affairs. Moving on to another selection – that of Harbhajan Singh in the T20 World Cup squad. None would doubt his talent. He has good numbers against his name to back that up. But his recent performance both is domestic and county circuit won’t testify for his inclusion. Given the fact that he is in the squad, he is almost certain to make it to the playing eleven – you don’t generally leave out such experienced players to warm your bench, at least not in India. Let us hope that he comes back to his lethal self that made him claim the top spot in Indian bowling in past. Yuvraj Singh has been reinstated to the Indian team for T20 World Cup. Before I go on and say anything about his selection, let me congratulate him; for he is a real fighter. I think the selectors have hurried on to their decision in this case. He must have played a couple of games before being selected. But this could still be passed as a calculated risk because he might play in the T20 matches against NZ and be aware of his standing. If he is fit and does play in the World Cup, that would be a big boon for India; for we all know how devastating and impactful he can be. Another decision that surprised me was of Ishant Sharma being picked for the test series. A lot has been said about the effort that he puts in and his commitment unlike Rohit Sharma’s. But the numbers don’t reflect likewise. Besides, he has not featured in a single game after his recovery from injury. Opportunities to play in the national team cannot be handed out like this – that too coming on back of not so impressive performances. Similarly, Suresh Raina has been rewarded for his good showing in the limited overs game by giving him a test berth. He is a class act in any limited overs game, but has failed to prove himself one in the longer format. These are certainly not good indications to the youngsters waiting on the fringe for their chances. Gambhir’s reinstatement as the vice-captain in place of Kohli could be termed nothing but a vague decision. If Gambhir has done reasonably well in this period, what did Kohli do wrong? Though I believe this might come as a blessing in disguise to Kohli who should just be left alone with his batting given the sublime touch he is in currently. There are a few more names that I could go on and talk about. But before that lets wait for the new selection panel to join the office and see how they fare with all the responsibilities or maybe liabilities that the outgoing committee has left for them. It is time for desserts, sweets and ice creams. A team of young and enthusiastic chefs who are specialists in these items are being flown in to appease those who are disappointed with the quality and taste of their main course prepared by some expert chefs renowned for their tasty main course. The management and admirers of these chefs look bewildered and they pin their hope on this new team to deliver quality and tasty food in their frantic efforts to restore their shattered pride. Can tasty desserts make people forget their horrible main course? This was the dilemma plaguing the BCCI and their selectors when they selected a team for the two T20s and eight ODIs involving Australia and Sri Lanka. The team selected looks a perfect blend of youth and experience. The baffling part of Indian cricket is the fact that a few cricketers are allowed to pick and choose their matches and tours while the others will be picked and chosen as per the whimsies and fantasies of the selectors. 39 year old Sachin Tendulkar included in the squad as he made himself available while the promising Ajinkya Rahane thrown out. Zaheer Khan is back. Sehwag included despite his horrible form. Are these three going to play any part in the 2015 World Cup in Australia and New Zealand? Have not the selectors squandered a wonderful opportunity to blood at least three youngsters in these testing conditions and build a nucleus for the 2015 World Cup team? Debate can go on but nothing more can be expected from this selection panel whose decisions have been criticized and questioned in every nook and corner of the country after the continuous Test debacles outside the subcontinent. Though Sri Lanka is the third nation in the triangular tournament, they cannot be ignored as a weak opposition considering the fact that they are coming after a tough tour of South Africa. Their players will be better accustomed to the bouncy pitches than the Indian players who were either injured or playing Ranji Trophy matches in the dust bowls in India. Australians are well planned as usual and will be a tough nut to crack in their home conditions. This gives a picture of the tough task ahead for the current World Champions to conquer Australia. In the big grounds in Australia, Dhoni’s captaincy skills are going to be tested. Athletic fielders like Raina, Jadeja, Kohli, Tiwary and Rohit need to be placed tactically to contain the runs. Running between the wickets will have to be improved. Suresh Raina’s vulnerability to short pitched bowling will be exploited. With Sehwag and Gambhir not in good form, there is every chance of the middle order getting exposed to the swing and bounce of the two new balls from both ends. The selectors seem to have anticipated this problem and their decision to include Parthiv Patel as a reserve keeper is a testimony for that. The two new balls from both ends will surely play a decisive role in Australia than in India. Will the ageing Tendulkar survive the rigors of an ODI series with the new rule not permitting runners? Umesh’s performance in the Test series has clearly proved what extra pace can do in Australia. With Ishant and Varun unavailable, the selectors could have included Ashok Dinda in place of Vinay Kumar for his speed. In Vinay, Praveen and Irfan, India has 3 similar bowlers and the Australians gave a glimpse of what to expect from Vinay Kumar by the way they treated him in the WACA Test. The Indian selectors have again selected a ‘strong on paper’ team more suited for Indian conditions like they did for the Tests but unlike the Test team, this team has some characters who can give a fight to the opposition. Praveen Kumar coming back after an injury, Irfan making a come back, Sachin and Zaheer having question marks on their ODI fitness, Dhoni, Sehwag, Gambhir and Vinay Kumar low on confidence, the Indian team management needs to get the right combination from the day one to make their presence felt in Australia. Some bold decisions will need to be taken and some youngsters will need to be persisted. Umesh Yadav needs to be handled with care and it is a pity that there is no fast bowler in this team to replace or support Umesh. This Indian ODI team does not inspire confidence and optimism in the Australian conditions and I foresee the Indian top order batting and medium pace bowling creating more headaches than other areas in the coming days. Let us wait and watch. Anyone who experienced the events leading up to Tendulkar’s half century on Day Two of the Melbourne Test would have been forgiven for thinking that the Boxing Day test was hovering towards a Tendulkar biopic fleetingly waiting to acknowledge a long awaited milestone. The next couple of days, however, seemed to outline the fact that the periphery of this achievement has rather harsh boundary conditions. As did the hopes of a victory on foreign soil, given that India’s next tour outside the subcontinent is a far two years away. Thus, yet another favorable Test result has vanished into oblivion, leaving many of us wondering over the secret behind the magical formula that Gary Kirsten possessed, that others didn’t. A logical thought would question the challenge posed by during those tours outside the subcontinent when Kirsten was in charge as compared a tour to England and Australia, the latter by no means pushovers albeit their recent results. Cricketing plans, in general, anticipate years of austerity and stability with fitness of talent pools ranking high amongst others. While talent remains plentiful in supply, the longevity of most remains a function of form and/or fitness. A lot of the younger players who’ve paid brief visits to the international setup resemble the yesteryear Internal Combustion Engines that possessed low volumetric and thermal efficiencies – a direct correlation to unfavorable statistics and rapid breakdown. Temperament remains a spark plug that pre-ignites when exposed to high temperatures. Having said that, it is important to remember that the inevitable day when the Indian batting would be forced to field a middle order that resembles the current Australian top order – sharing a grand total of five test matches between them – isn’t far away. Whether the best laid plans weave a middle order fabric that fills the gap between the large sized shoe and small feet will remain unanswered for some time to come, it will be worth persisting with a few who’ve shown that with time, maturity evolves. Persisting with Virat Kohli for the rest of the series, irrespective of the statistics that come out, is one way to tap the right ore. Given that he has matured into an outstanding ODI cricketer, it is hard to imagine why he cannot replicate his achievements in the longer formats. This would, on the other hand, mean shutting the doors for Rohit Sharma this tour, who seems to have picked off from where he left off the last time he toured down under. He has certainly seen enough downslides to let this hit his game hard again. The archetypal Indian sentiment would find it hard to drop a veteran to accommodate a couple of youngsters given the lack of proximity of the next tour abroad. One may find it even needless to house such a need given that a prolonged gap wouldn’t require youngsters to be armored with foreign soil experience as immediately as the present moment. Even if the contrary decision was made, there is every chance that a few selectors could be painted as villains by a section of the fans and media for robbing their ‘local legends’ of a last ditched attempt to gain glory. The fact is hard to argue against, given that the veterans have had very good track records down under during previous tours. But again, only one out of the four scheduled tests have been completed – even if it was premature. A Test match that gets over with over a whole day’s play left reflects quite strongly on either the nature of the wicket, or a single sided dominance. The effect of losing a potential entire cricketing day dances to a different tune than the one set by Samoa changing time zones in order to remain in line with its trading partners who are nearly a full day ahead. The key for India to succeed will remain focal around sticking to this combination. The inabilities exposed haven’t changed with time – the opposition tails have forever wagged at amplitudes that summate those of all hundred odd Dalmatians. A large part of the blame, as gathered through eavesdropping on discussions between common man and common man during train and bus journeys, among others, has been cannoned towards MS Dhoni and his ‘defensive’ methods. The picture painted resents a star who neither takes his himself nor the dream job too seriously. Although in reality, the belief must be that the Indian tail fails to place a price on its wicket. As much as men want to hate (yet find it hard not to like) Harbhajan Singh, he proved the most infuriating of all lower order batsman to get out, even amidst bouts of unaffected public depreciation down under. Ashwin, a craftsman plying the same trade, seems the nascent player showing signs of steadiness amongst a sample that includes the Indian skipper. Dhoni’s lack of inventiveness in wiping out an opposition tail would certainly have been neutralized, or even forgotten, had his willow yielded more runs. The series is still young and alive, and whatever was learnt out of Melbourne must be applied in Sydney for sustenance. This would mandate sticking to the same combination, unless injuries hamper the thought, if India hopes to gain anything out of Sydney.